Tinkerbell shoes – and absolutely loving them. Curt and Nancy’s youngest son, Jake, loves our dog, Daisy. Here they are, cuddled up. I took the girls to the Duck Pond just south of campus. Elli ate the bread instead of feeding it to the ducks. I did hear her say “quack, quack” several times! See the pink dot in the middle of the picture? Anjali ran around that pond over and over again. So much energy! She loved chasing the ducks. Okay, I could not resist this picture! Anjali loves Cars, Finding Nemo, and Toy Story. They only make boys’ underwear with these motifs. Hey, as long as she keeps them dry, right? And here is Anjali’s first school picture. 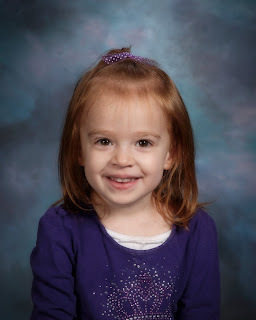 I don’t know if I’ve ever seen a school picture this cute.